I am working on a program that extracts the stickers on the puzzle and then later on finds the RGB of them. Currently, I am at the point where I want to remove any contours that aren't "square" like. I was wondering how I could do this. What I do is I load the image, gray it, blur it, canny edge detection, dilate it find contours and draw them. Is there a way I can draw around the contours instead of filling them in? And remove contours that aren't roughly the same size around or have almost 90 degree angles? I suggest using color thresholding (inRange() ) then get contours. Now you want to filter unwanted contours right ? 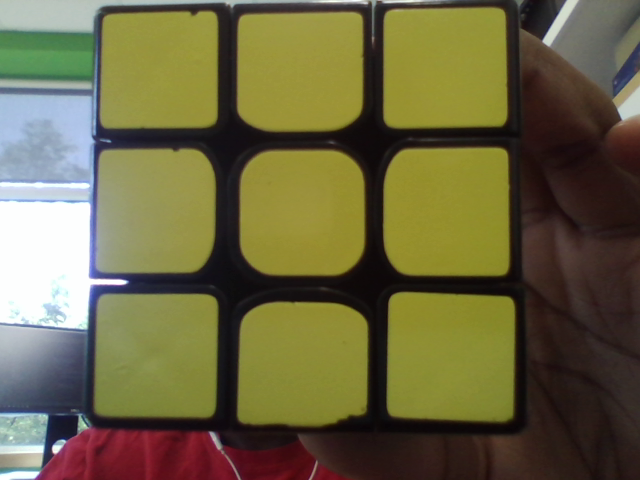 Thanks this helps, however is there a way I could make it more "flexible" like looking if it has some sort of square shape, like the lengths of the sides are the same and or has almost 90 degrees in the contour? 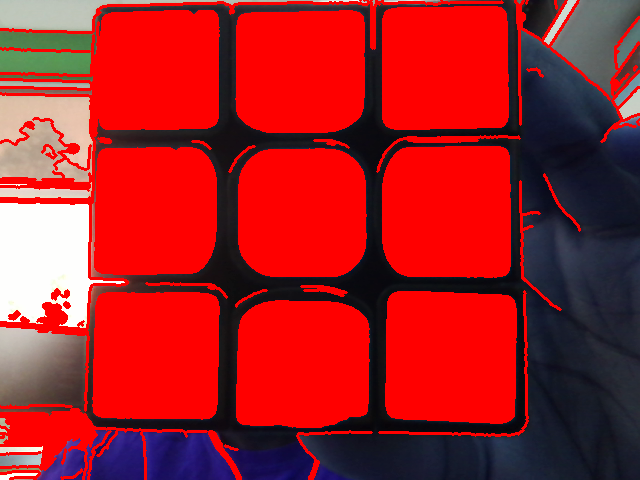 The reason I ask is because the image won't always be this one because it is a captured frame the cube could be captured closer or further away. You can use cv::contourArea() to obtain A and cv::arcLength() to obtain p.
If I remember correctly, for circled blobs you are expected to get values very close to 1. For triangled blobs you are going to get low values around 0.3. For squared blobs you are expected to get values around 0.7-0.8. This will allow you to filter some unwanted blobs. That is not right, the denominator in the equation is the arch squared, not the square root. But you should first verify the values you are getting for the blobs to create the threshold. The values I wrote in my answer are just indicative.